Billy W. Gardner pens a straightforward and practical study guide examining the nature of the Bible in an easy-to-read weekly format. 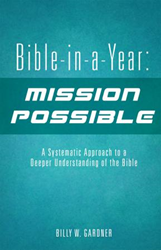 Billy W. Gardner’s new book, Bible-in-a-Year: Mission Possible - A Systematic Approach to a Deeper Understanding of the Bible, ($16.99, paperback, 9781498446068; $8.99, e-book, 9781498446075) is a faith-building read examining verses – from Genesis to Revelation – useful to stimulate a thoughtful discussion. His biblical interpretations of themes and events reflect his connection to Christ and attentiveness to God. He enables readers to explore how to conduct small group meetings and motivate groups to study the Bible, incorporating the scriptures in every aspect of one’s daily practice. Gardner prompts each person to hone in on valuable verses as each practices his or her commitment. The author stresses that this is the first guide, that he is aware of, that leads the reader through the Bible using a small group discussion format. His results show that the majority of participants in his Bible study have been successful in completing the Bible in one year and have experienced spiritual growth in the process. This book is ideal for all ages, and those too busy to enhance their spiritual depth, but yearn to increase their knowledge of the Bible. Billy W. Gardner grew up attending church and has led multiple ministries and small groups for over 20 years. This study guide utilizes Gardner’s vast biblical knowledge as he shares his own inspiring spiritual evolution. Xulon Press, a division of Salem Media Group, is the world’s largest Christian self-publisher, with more than 15,000 titles published to date. Retailers may order Bible-in-a-Year: Mission Possible - A Systematic Approach to a Deeper Understanding of the Bible through Ingram Book Company and/or Spring Arbor Book Distributors. The book is available online through xulonpress.com/bookstore, amazon.com, and barnesandnoble.com.